Pregnancy does not show any specific predisposition to pericardial diseases. The more common form of pericardial involvement in pregnancy is a benign mild pericardial effusion, the incidence of which increases with duration of pregnancy reaching about 40% by the third trimester, resolving uneventfully after delivery.1 Larger effusions should raise clinical concern for an infection, autoimmune disorder or malignancy, which occur sporadically in pregnancy. We report the case of a 34-year-old term pregnant woman who presented with a massive pericardial effusion with cardiac tamponade. A 34-year-old woman presented to the emergency department in her 38th week of gestation with a five-day history of breathlessness. Her dyspnoea was rapidly progressive and she was in New York Heart Association (NYHA) class IV. There were no previous comorbidities. Blood pressure was 106/80 mmHg with a heart rate of 134 bpm and a paradox of 14 mmHg. Respiratory rate was 26 per minute. The neck veins were distended. She had muffled heart sounds. Routine investigations revealed a normal leucocyte count with haemoglobin of 95 g/L. Serum B-type natriuretic peptide (BNP) was elevated at 144 pg/ml. Electrocardiogram showed a sinus tachycardia with a low voltage graph. Echocardiography showed mildly dilated right heart chambers with massive pericardial effusion and tamponade physiology. Pericardiocentesis was performed and around 500 ml of sero-sanguinous fluid was drained. Pericardial fluid was a transudate with a fluid protein of 1.9 g/dL, albumin 0.99 g/dL and lactate dehydrogenase (LDH) of 75 units/L. Cultures of fluid were sterile. Adenosine deaminase and a polymerase chain reaction (PCR) of the fluid for Mycobacterium tuberculosis were negative. Malignant cells were absent. Anti-nuclear factor was negative. She stabilised after removal of pericardial fluid. A continuous murmur at the left sternal border could now be appreciated. 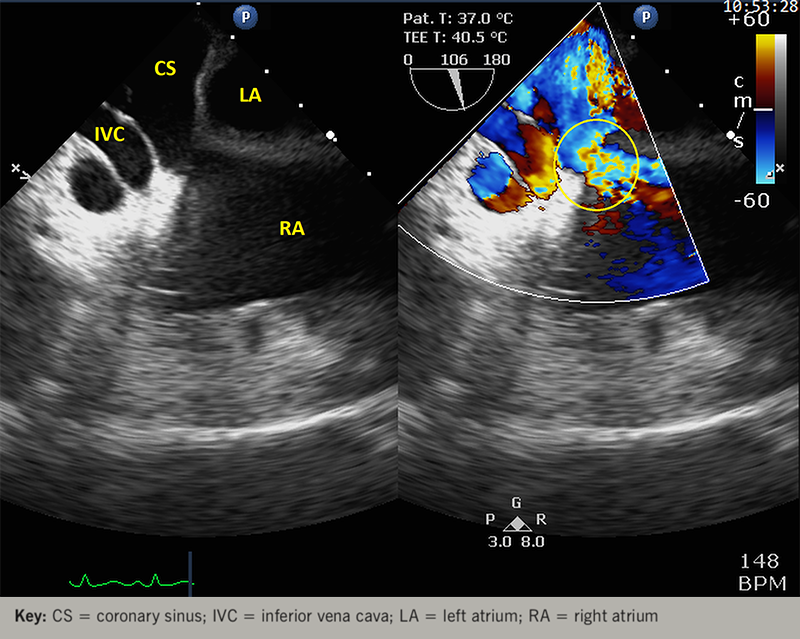 Echocardiography post-pericardiocentesis demonstrated increased flow in the coronary sinus and turbulence in the right atrium. Abdominal ultrasound showed a single live foetus at 37 weeks gestation. Following obstetric review, the baby was delivered by elective caesarean section under general anaesthesia. Peri-operative transoesophageal echocardiography revealed a grossly dilated right coronary artery (RCA) originating normally from the right cusp of aortic sinus and draining into an abnormally dilated coronary sinus (figure 1). Coronary angiography confirmed the diagnosis of coronary arteriovenous fistula by showing a highly tortuous and grossly dilated RCA draining into a dilated coronary sinus with a normal left coronary system (figure 2). A catheterisation study revealed a step up of 10% in the right atrium and a cardiac output of 6.07 L/min by Fick’s equation. The pulmonary to systemic blood flow ratio (Qp:Qs) was calculated to be 2.44 suggesting a significant left to right shunt. The patient was recommended to have surgical closure of the fistula, but she declined for the present since she was currently asymptomatic. Our patient presented with a large pericardial effusion with tamponade at almost term pregnancy. Pregnancy itself induces a high cardiac output state, with the cardiac output increasing by 50% above pre-pregnancy levels by term.8 We believe that the combination of a CAVF with pregnancy and anaemia precipitated high output cardiac failure leading to the development of a pericardial effusion in our patient. Various theories have been put forward to explain the pericardial effusion associated with a CAVF.9 The wall of the fistula is genetically weak. The shear stress from the high shunt dilates and weakens the vessel wall, resulting in extravasation of blood into the pericardial space. Hemosiderin laden macrophages have been found in the pericardial space, suggesting repeated haemorrhages into the pericardial space. The odd thing in our patient was that the pericardial fluid was a transudate. We believe that the high output state induced by pregnancy exacerbated the flow though the CAVF, thereby, shifting the hydrostatic pressures in favour of fluid shift into the pericardium. In addition, blood may have exuded into the pericardium from the fistula. After delivery, the cardiac output begins to reach pre-pregnancy levels by about two weeks.10 Our patient also showed a favourable response after delivery, with the effusion almost disappearing. Transoesophageal echocardiography provides useful information about the fistula.11 Coronary angiography is the definitive diagnostic technique providing detailed anatomy of the fistula with respect to size, origin and the drainage site.12 Cardiac catheterisation provides the haemodynamic evaluation of the fistula. Our patient had Qp:Qs of 2.44 suggesting a significant shunt. According to current guidelines, percutaneous or surgical closure is recommended for large fistulas, regardless of symptoms. Closure is also recommended for a small-to-moderate CAVF with symptoms.13 Both transcatheter closure14 and surgical closure15 of the CAVF may be performed, depending on the availability of expertise and the fistula anatomy.